This issue is a step up from the already intriguing #107. The plot thickens, as they say, when some new and old faces, all seemingly unrelated, are thrown into the mix. Where #107 was a frustratingly fast read, this issue takes its time and I’m surprised to see this many scenes play out in 22 pages without any of them feeling the least bit rushed. And, just like last issue, the artwork is top-notch. The issue begins exactly where the last one ended, with Matt meeting Ben Donovan in jail. Though clearly innocent of the crime for which he is being executed, Donovan refuses any help appealing his case and seems more terrified of what will happen if he’s not executed than he is of dying. In an unexpected fit of fear-driven rage, his forehead has a close encounter with Matt’s jaw, and after his attacker is dragged off, Matt shows up on Dakota North’s doorstep with a bruise matching hers. Dakota, meanwhile, is busy talking to Luke Cage and nursing her wounds when Matt shows up. I’m a big fan of the panels showing Dakota’s Vogue covers before cutting to the shot of Dakota “live,” mirroring the exact pose that is in the covers. It’s very nicely done. I’m not sure I like what having those covers on the wall says about her as a character, but as an artistic trick, it’s pretty cool. Either way, the two compare notes and set out on their respective investigations. Dakota swings by the precinct to talk to Kurtz, where she finds out the identity of her attacker, and Matt has a rendez-vous with Ben Urich in a diner. Matt is really getting back in the game in this issue, and it’s obvious that the mystery before him has him intrigued. The action part of this issue sees Dakota wielding a baseball bat in a very nice scene and Daredevil hitting up thugs in a bar. While I don’t particularly mind the bar scene, I suspect it played out that way for the sole purpose of appeasing the “must see Daredevil action, or else I’ll ask for my $2.99 back” crowd. Wouldn’t it have been somewhat cooler to just have him waltz in there and go, “Start talking, guys,” with the intimidation factor alone being enough of an incentive to get them to spill their beans? In which case you still could have included the shot of him detecting a gun being pulled behind his back (which constitutes a nice use of superpowers in my book). Either way, the reader leaves this issue even more mystified than he was going in as we not only meet someone with undeniably close ties to Dakota North, but a character from Daredevil’s distant past as well. And by distant past, I mean the first Miller run. 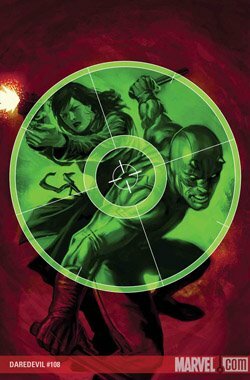 I don’t know how Brubaker and Rucka are going to tie all of these threads together, but I’m surely going to enjoy seeing them do it. Great issue!